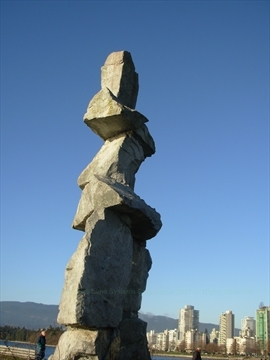 The Inukshuk Statue/Monument is one of the newest and most striking monuments in Vancouver! It is rock/stone statue that is striking! It is fantastic to take photos in front of with Vancouver's English Bay in the background. Inukshuks are a symbol from the north polar region of the world especially for the Inuit people in northern Canada. 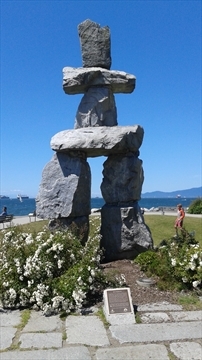 The First Nations people around Vancouver did not make Inukshuks. In the Inuit language the name Inukshuk means "in the likeliness of a human". Every Inukshuk is unique in shape because they were made of whatever rocks were near that location. Inukshuks are used to mark a place for navigation or as an important location such as a burial ground or important location. The arms and feet, when pointed in a certain direction indicated the way to go for navigation. This ancient symbol of the Inuit culture is traditionally used as a landmark and navigational aid and also represents northern hospitality and friendship. Constructed of grey granite by Alvin Kanak of Rankin Inlet, this monument was commissioned by the Government of the Northwest Territories for its Pavilion at EXPO 86 and later given to the City of Vancouver. 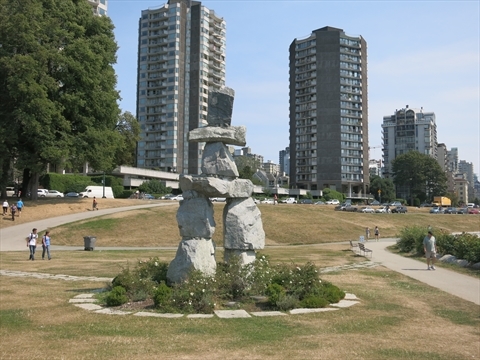 In 1987, the Inukshuk was moved to this site and sponsored as a gift to the City by Coast Hotels through the Vancouver Legacies Program. 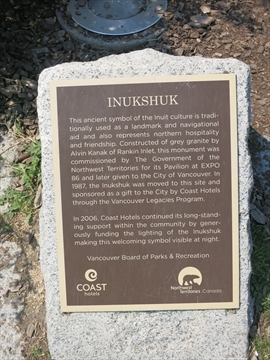 In 2006, Coast Hotels continued its long-standing support within the community by generously funding the lighting of the Inukshuk making this welcoming symbol visible at night. 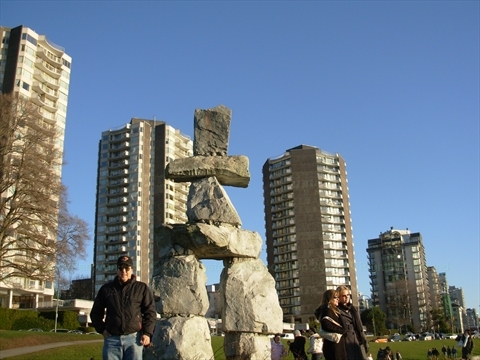 Where is the Inukshuk Monument at English Bay, Vancouver, B.C., Canada? The Inukshuk Monument is located at English Bay in the West End of the city of Vancouver, British Columbia, Canada. It is on a point on the east side of English Bay Beach just off of the English Bay Seawall. Nearby is the English Bay Bath House. It is also only a short distance to Stanley Park.